As a real DIY enthusiast I like to maintain all vehicles myself. 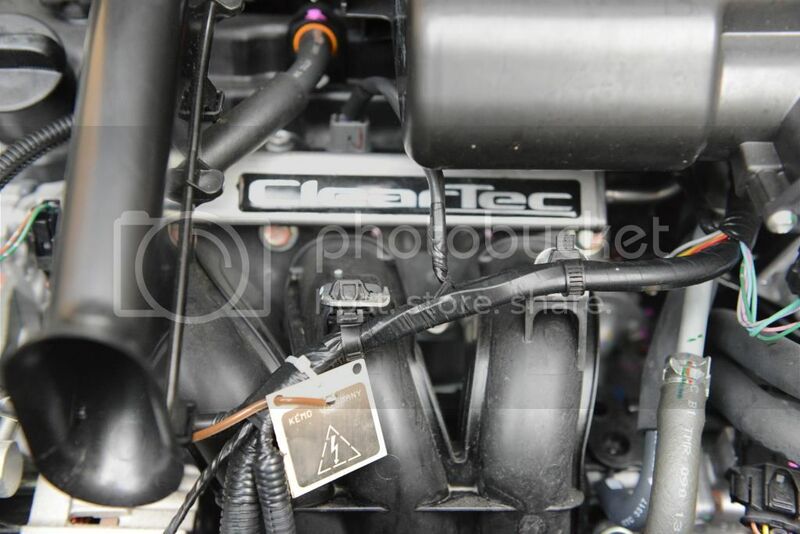 A new Spacestar, aha lets see: Airfilter, Oilfilter, Plugs, Brakefluid, Engine Coolant, Washer Fluid EASY! 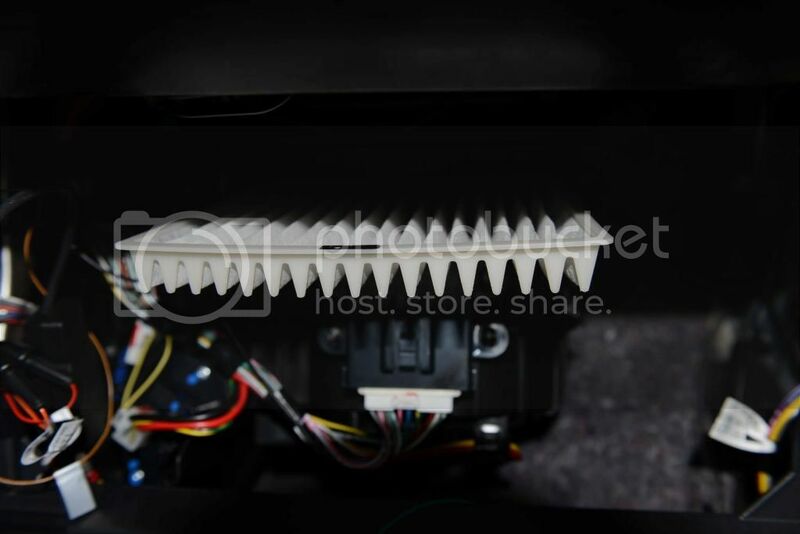 Interior Filter......... After a small search I found it. 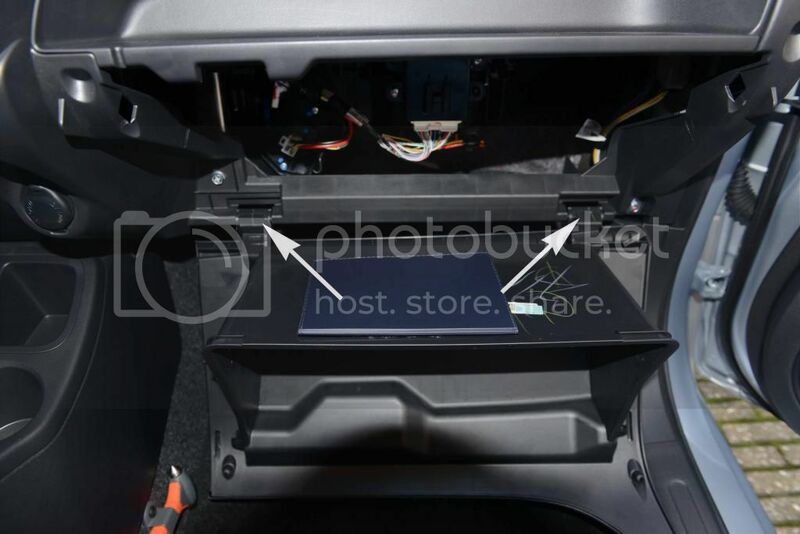 The Interior Filter is located in the cabin on the passenger side behind the glove box! 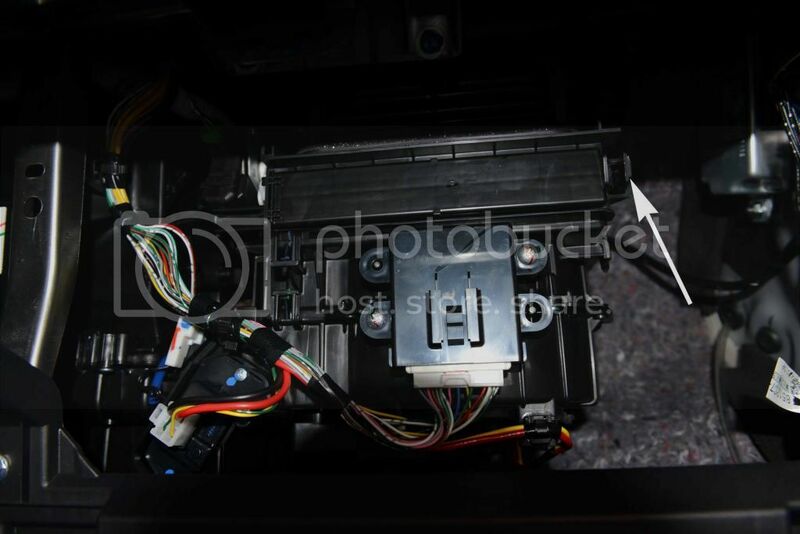 1) Open the glove box and remove its content. When it is opened you can see the two restraints holding it, one on the left and one on the right (at the arrows). Push the walls of the box inwards (as the arrows indicate) and voila now you can drop the box to the floor. 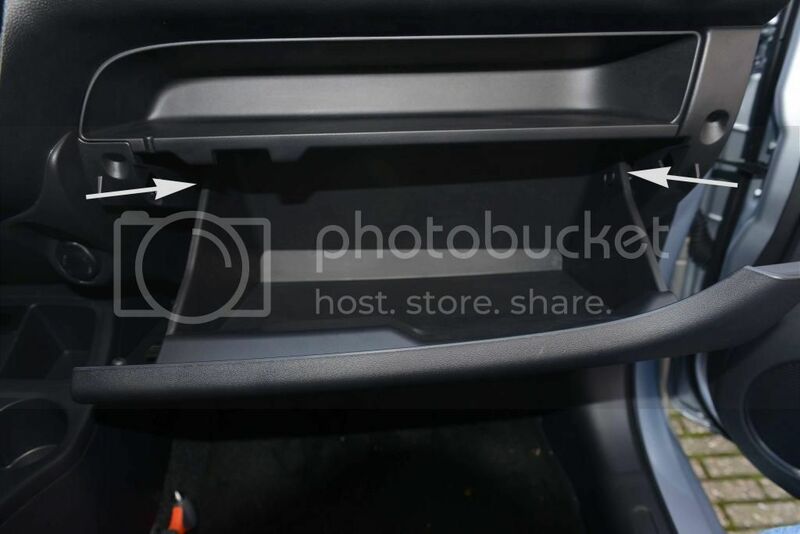 2) The glove box is now only connected to the dash at the hinges (see arrows), a gentle pull with the box in a horizontal position will release the hinges. 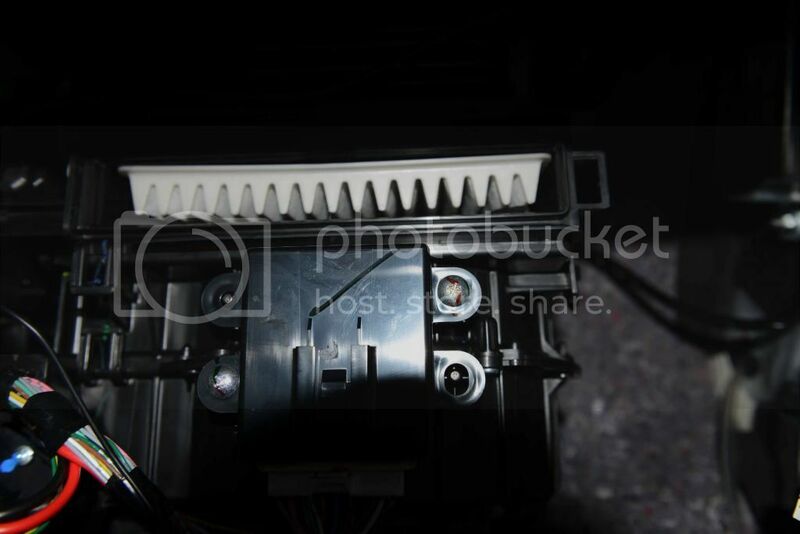 3) With the box removed you can now see the heater unit with blower and electronic control box. Right above the fan there is a little compartment with a small cover. The cover can be opened by pushing the release (see arrow) to the left and pulling the cover towards you. 4) And voila there it is, the filter can be removed by pulling it towards you! 5) Note that some filters are designed to have the airflow through it in a certain direction (indicated by an Arrow on the filter itself), in this case the Arrow should be pointed downwards. As you can see it is really easy to install a new Interior Filter youself! I hope there are more DIY enthusiast out there who will post a lot of How To's on this forum, so we can all enjoy our Space Star/Mirage even more!! Did you loose all your Warranty now you installed another Horn? I installed a Parrot kit and I'm installing a Marter Defence system to avoid having these creatures mess up my car under the bonnet. BTW what Horn did you install? I was also thinking of installing a louder one. As it seems other divers tent not to yield for the little Space Star when the should and then laugh at its horn when you use it! Very very strange I never ever had that with my previous car!!! Last edited by zefke; 12-05-2013 at 09:09 AM. Am not sure, have to check with them about the warranty for the horn change. Marter defence system? what is that? Got it on ebay, only use the low tone, high tone sounds awful. Too lazy to build the holder for both. I had them both on my Galant and I love them. This is my 2nd set. Cool Horns are they / is it loud? You just hooked it up instead of the old one with no Relay? A Marten Defence System is a system to keep the Beech Marten (Dutch: Steenmarter) away from under your Bonnet. (See: http://en.wikipedia.org/wiki/Beech_marten). These creatures tend to like it under the bonnet of a car, and while they are at it bite in everything they see, Ignition Cables, Electrical Cables, Water Hoses, Bonnet Isolation Material etc etc.... (Ask me how I know ). Basically it consist of a Ultrasonic sound system which produces noises the marten can hear and is said to keep away from (we humans can not here these sounds). Unfortunately this alone is not enough to keep them away (Ask me how I know ). They also have systems which add a high voltage unit producing 200 to 600Vdc pulses on small plates which you can put strategically under your bonnet. When the Marten, curious as it is, sniffs or better bites at these plates it will get a nasty shock and is not likely to come back and have second try (it does NOT kill the animal, just scares it off). 1) Here you can see the Defense System with the Ultrasonic speaker on top. 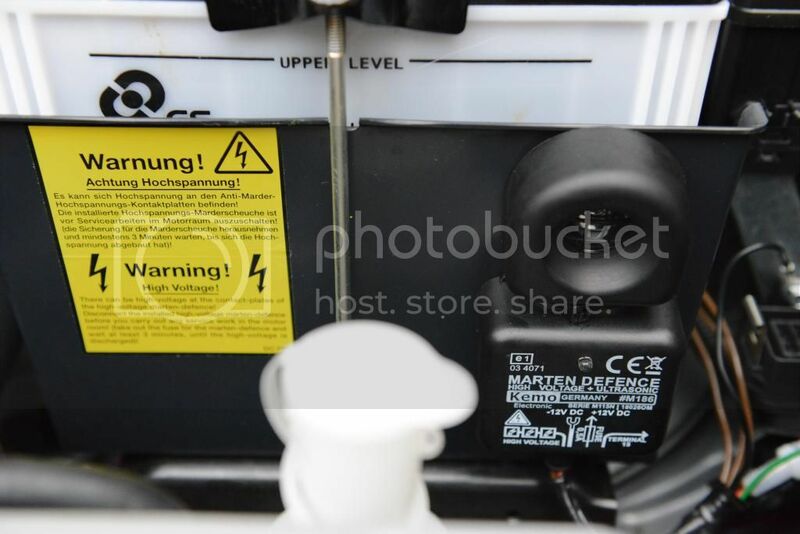 2) Here you can see one of the High Voltage Plates installed near the Engine. BTW: You should tell your Mechanic if you install a system like this, or better switch it off before working under the bonnet. Unlike the Ultrasonic Sound we humans can definitely feel the 600Vdc (Ask me how I know ). Last edited by zefke; 12-05-2013 at 09:11 AM. At least those beasts are super cute!!!! Thank you for the info Paul! Believe it or not but the creatures you have in the Schilderswijk in The Hague are more widely spread then the Marten. So its NOT having a Marten instead of them, it is having both at the same time. Altough I must agree that the Schilderswijk in The Hague is famous for this kind of species. You might find the Marten super cute, believe me that will change very quick once you had one of them under your bonnet. Last edited by zefke; 12-05-2013 at 11:37 AM. I certainly hope I will never have to deal with the problem ;-) Enough to watch out for one problem. They even tried to broke into houses recently! Thanks for the write up zefke. I've added a link in the Interior, Audio & Video Sticky Index. Paul: thanks for the detailed write-up! And both of you for the various "ask me how I know" chuckles.